Rota management is one of the biggest headaches for many of our clients – with issues ranging from unexpected absence, scheduling far enough ahead to ensure consistency and managing contractors or freelance staff. 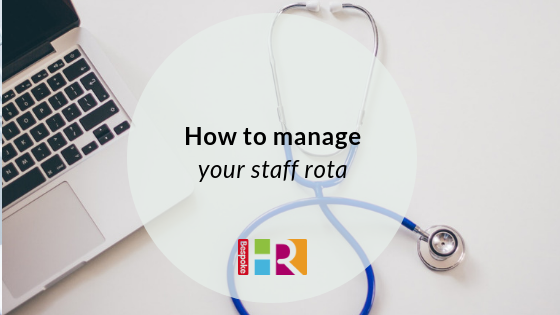 A well-organised rota system ensures your business runs smoothly but can also highlight any gaps in performance or absence from staff. Plan the rota at least seven weeks in advance to ensure consistency and allow staff to plan their schedules. Find the tools which work for your business – this can range from spreadsheets, paper-based, rota management systems or Google Sheets. Ensure your job descriptions and contracts are up to date so that you know the contracted hours for each employee to roster. Look for consistency to ensure the rota is ‘fair’ and the same employees are not working unpopular shifts, or those they have expressed a preference against. Again, referring back to contracts will help with this exercise to determine what they are legally obliged to do. Implement a system for notifications or changes so that they are alerted immediately (this could be via email or another channel which works well for your business). Keep this consistent so staff never miss an alert or change. Encourage shift swaps to save you time. If employees want to change a shift then they can do this between them. However, it’s important that there is a formal process for this whereby a manager must sign off this agreement. Have a back up plan for unexpected staff absence, this could involve bank staff or other employees that could be called in at short notice. Take time to look at your rota data and attendance patterns – are there staff who are continuously absent or late for shifts? This will help you to understand if there is under-performance within your business. Read our blog on how to manage under-performing staff. If using an electronic rota system, ensure your staff have access to it so that they can check their hours regularly.